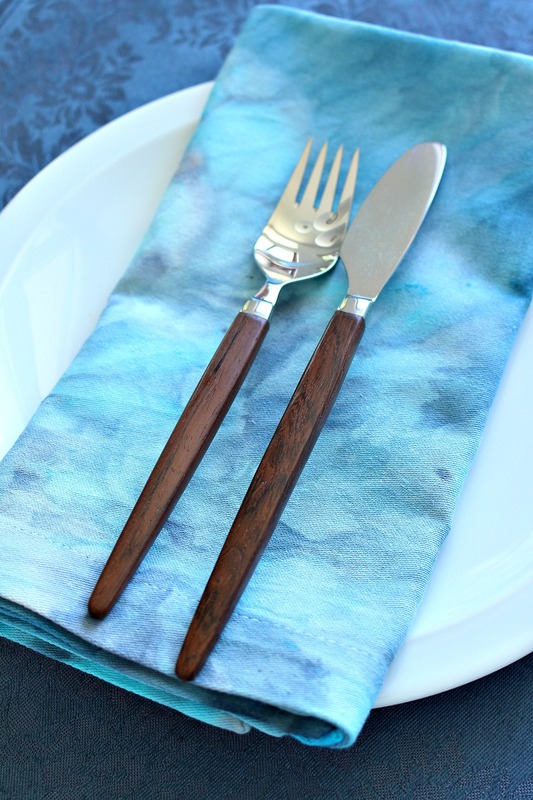 I mentioned in the post about dyeing my damask table linens that I was getting experimental with fabric dyeing and today I’m so excited to show you my newest dyeing obsession: how to ice dye. I have so many ideas swirling around in my head but, before attempting some more complicated projects I wanted to just try some low commitment ice dyeing experiments. 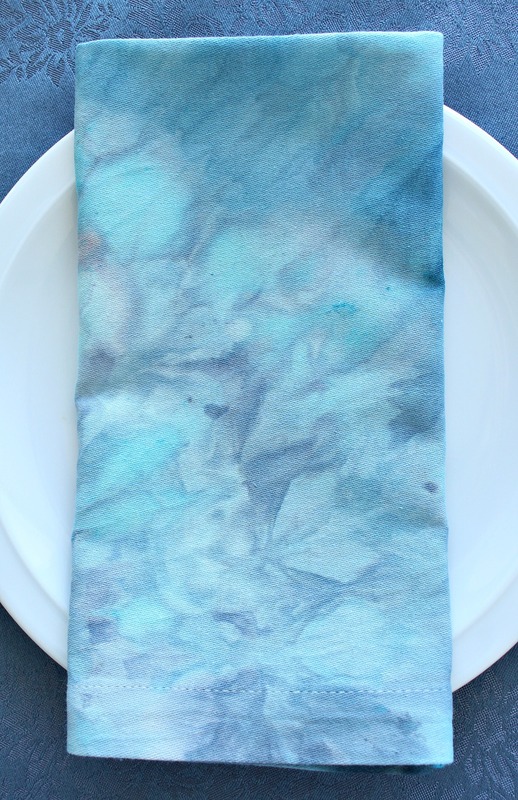 Aren’t my new ice dyed napkins beautiful? I’m so mesmerized by the organic feel of the design! I originally wanted to try ice dyeing in the winter, with snow, but Szuka and a pair of neighborhood foxes are in this hilarious peeing competition and so there was so safe snow for me to use. It’s too bad because learning how to ice dye was easy – making and stocking piling enough ice was the tough part, haha (I highly recommend just buying a bag). 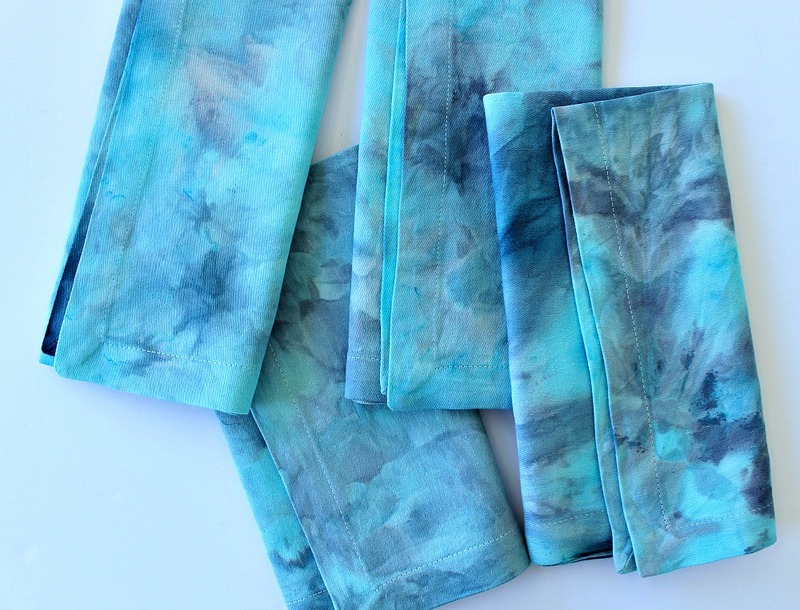 Once you realize that learning how to ice dye is SO easy, you’ll want to dye everything and that’s okay, because a little bit of powdered dye goes a long way. 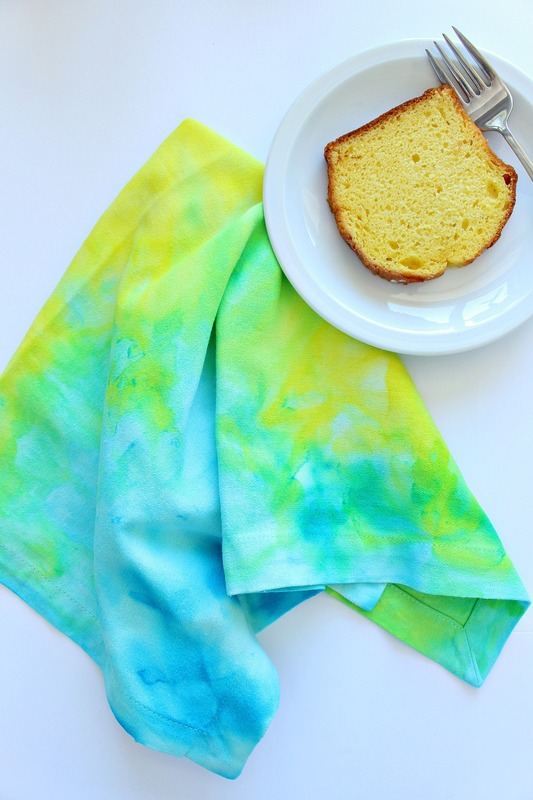 Here’s what you need to ice dye a set of napkins but you’ll gave lots left over to try tons of other ice dye projects. I bought an awesome cold water dye starter kit, with four colours of dye (turquoise, lemon yellow, fuschia and jet black) and a small packet of soda ash, on Amazon. It was a great way to do some experimenting without committing to – or being overwhelmed by – the huge selection of Procion dyes available! If you want more colour variety, this pack of 8 colours looks good – but you can also buy colours individually. 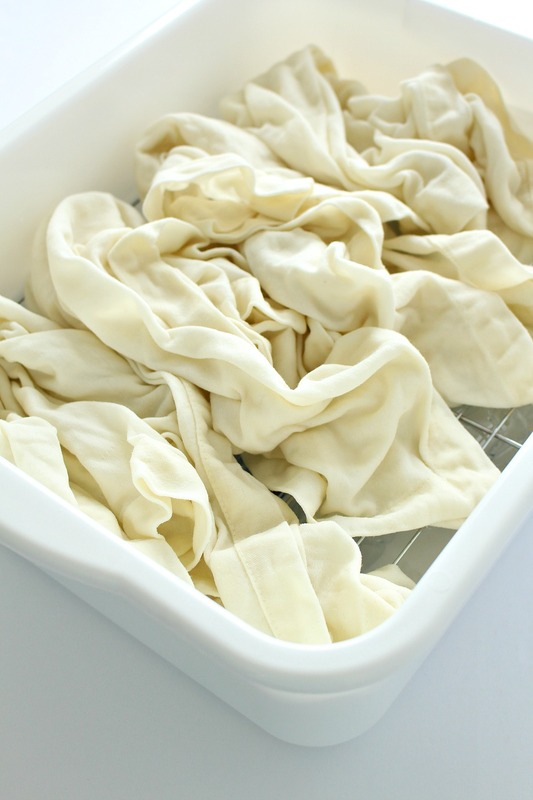 First wash the fabric to remove any sizing, oils from skin, etc. 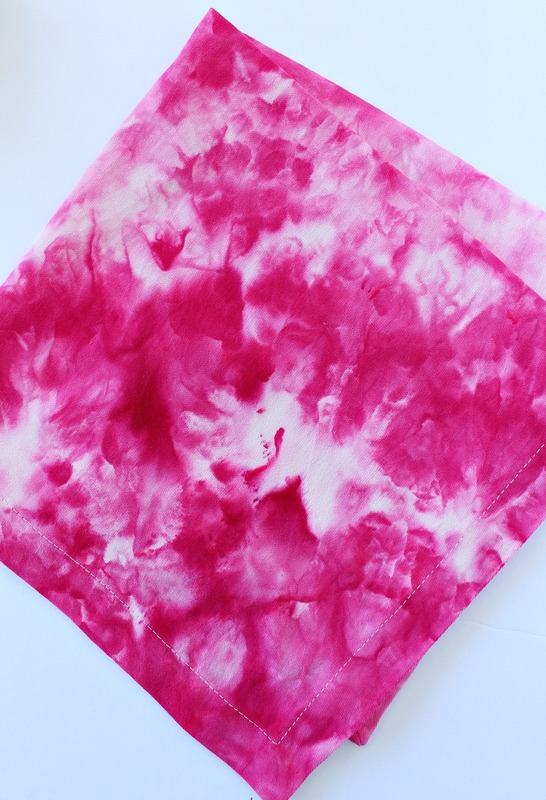 You can use a fancy textile detergent, to help prepare the fabric for dye, but you can also just toss it in the washing machine as per usual – which is what I did. 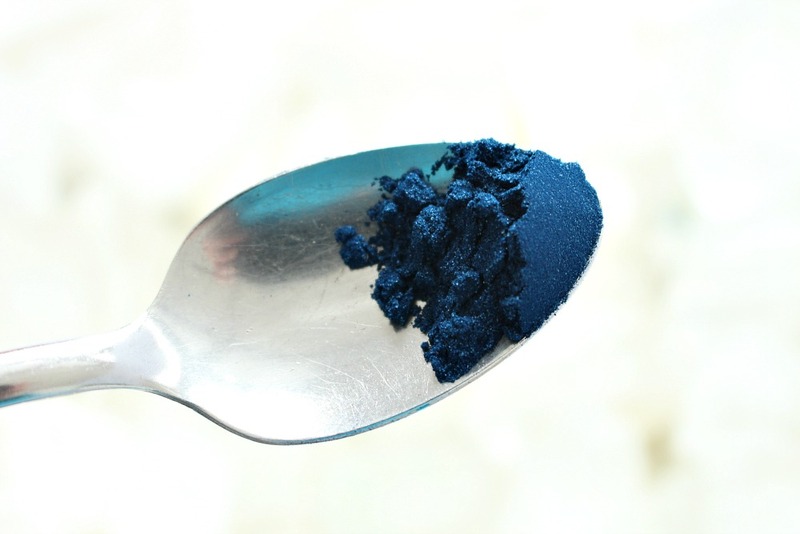 Mix 1 cup of soda ash in a bucket with 1 gallon (4 liters) of water and stir until dissolved. Submerge the laundered fabric and let soak for about half an hour. This stuff burns the sinuses, so use a dust mask and gloves! 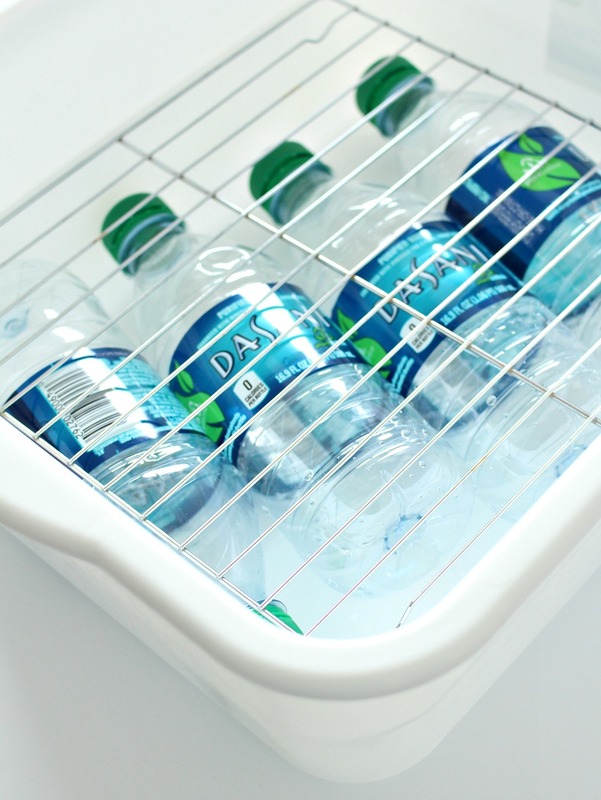 Meanwhile, set up a basin with a cookie rack propped up on some empty water bottles – or anything to keep it up. You want enough room underneath the dry rack so that when the ice melts and the basin is filled with water, the fabric doesn’t sit or dip into the dye bath that’s created. Once again don that dust mask and gloves, and sprinkle the ice with powdered Procion dye. I used a couple teaspoons of turquoise and lemon yellow for my first set, and a couple of teaspoons of turquoise and jet black for the second. 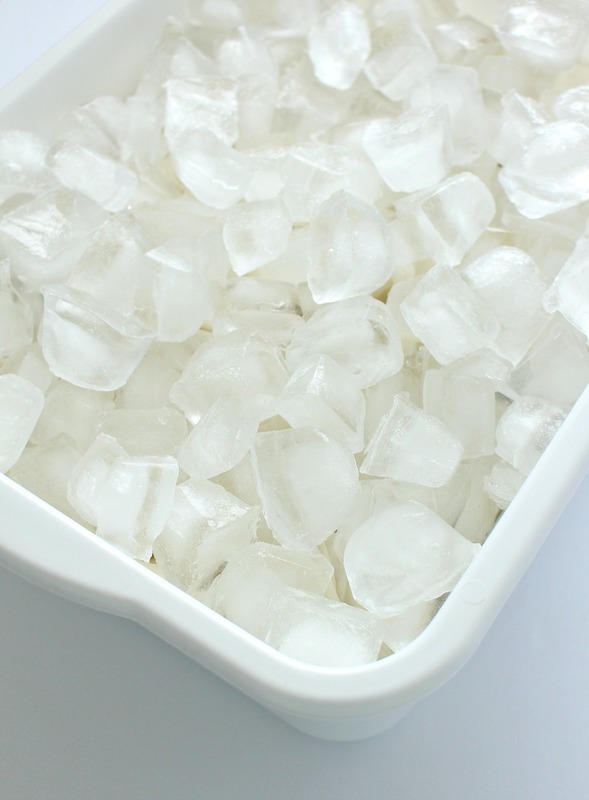 Set it aside and wait patiently for the ice to melt! When the ice has melted, rinse the fabric in cool water until the water runs clear. Then launder with like colours. 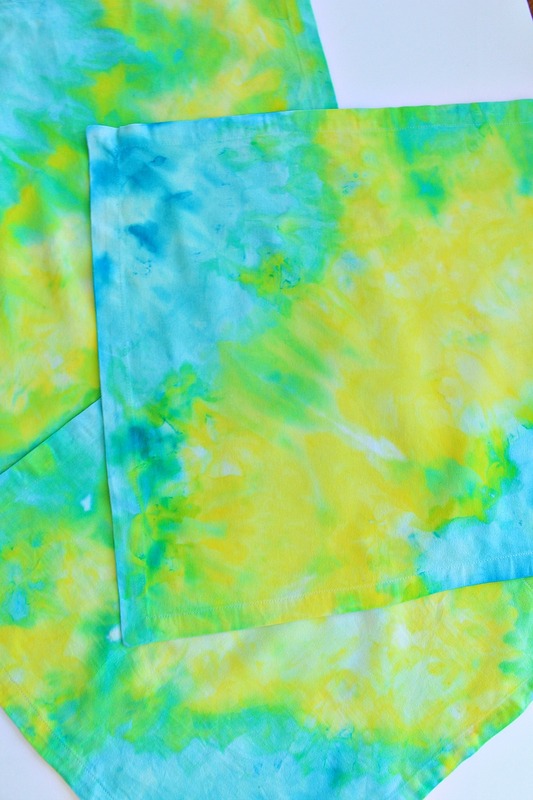 I made the yellow, aqua and green ice dyed design first but at first I didn’t love the shade of green that the lemon yellow and turquoise mixed – it was a smidge more lurid than intended, but it grew on me and I think the set of four napkins will be fun and summery for patio dining. I tried too hard to control the design with how I scrunched the fabric and where I sprinkled the dye and it didn’t turn out how I expected. 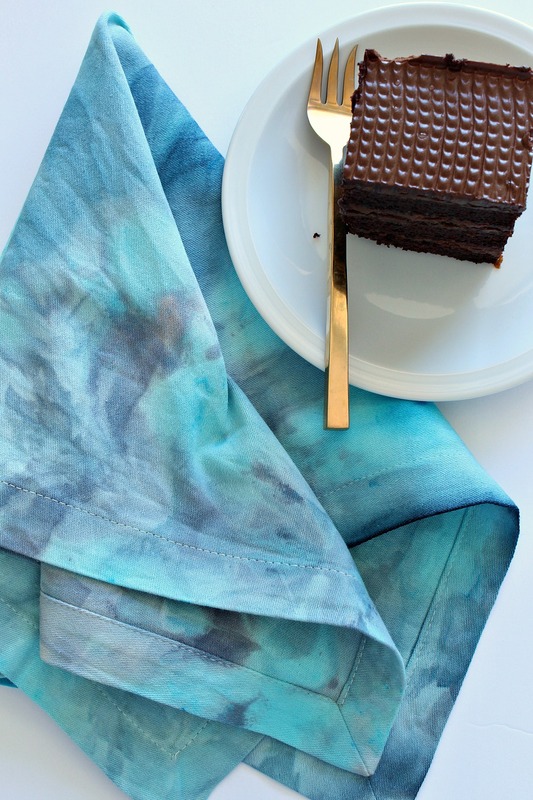 With this project, you really have to let go and learn to let the dye work its magic while you sit back and enjoy the surprise. The second design, with a more muted turquoise and grey color palette, is definitely my favorite. I scrunched the fabric in more of a ball and sprinkled the two colours liberally and randomly. I relaxed and didn’t try to encourage any dye patterns or designs. It worked! I love the smokey teals and layers of soft grey that emerged, with pops of my favorite aqua – of course. I also tried ice dyeing with a single colour, which turned out to be quite striking! The Procion Fuschia is really quite vibrant. I want to experiment a little more and try using just the jet black. 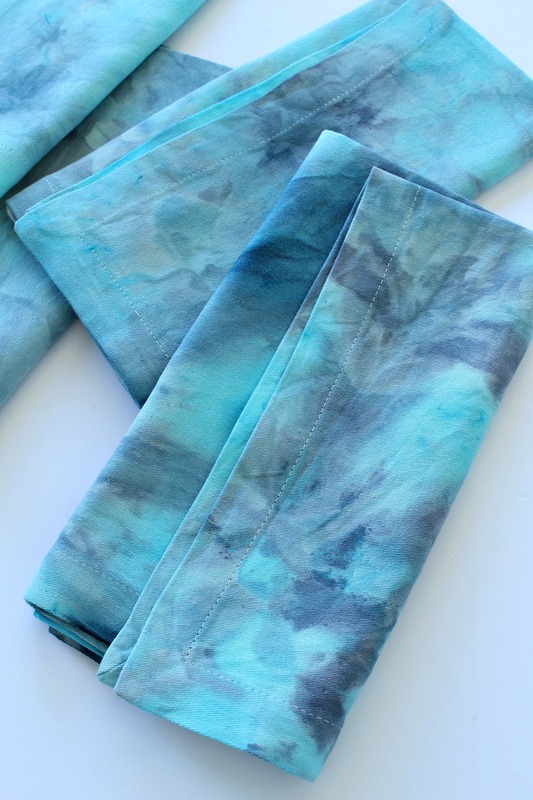 I also really want to get my hands on some pretty lightweight cotton for a dress or blouse. 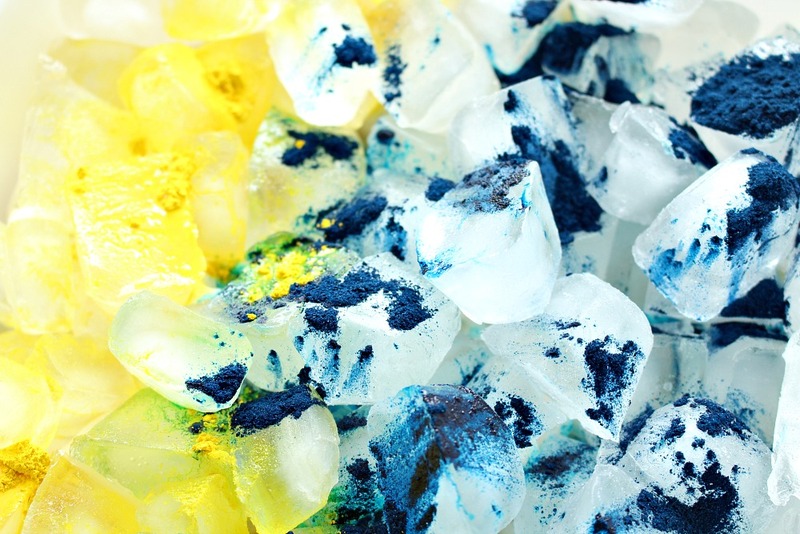 I’m hopelessly addicted to ice dyeing – nothing is safe in my house! UPDATE: Check out my ice dyed pillows, which turned out even more lovely than these experiments. Previous Post We’re Buying a Boat! Next Post Do You Love/Hate Truncated Blog Posts? P.S. My URL Has Changed! 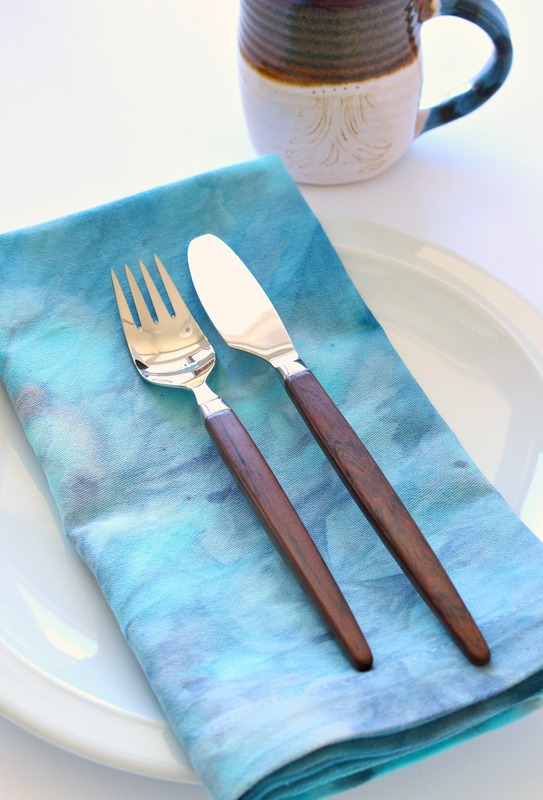 The napkins turned out really pretty and what a clever way to dye them. 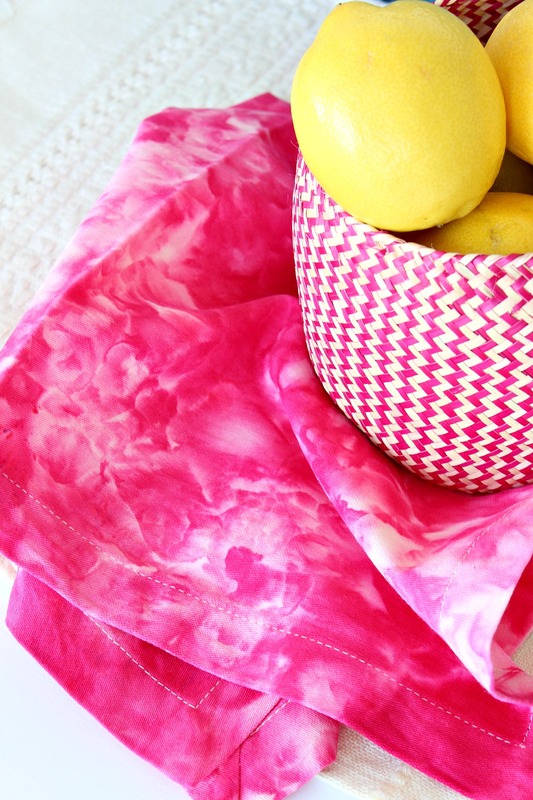 The food/container photos show them off so well, especially the magenta with the yellow lemons, so creative combo. Hope to see more soon. Those are truly fantastic!!! Thank you for talking about using gloves and masks…SO SO important and so easy to forget or neglect. Thank you! 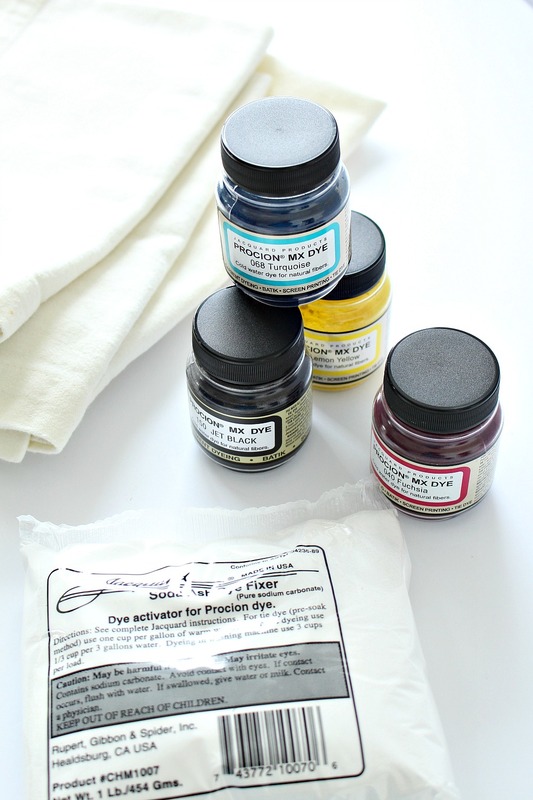 Yes – safety is so important with DIY projects, especially when we're handling paints and dyes. I'm not always as diligent as I should be, but I try to remember! Tanya, this might be an early Christmas project. I've used procion dyes in the past and love the brilliant colours. You always have such interesting ideas. I AM shocked!! I also made a turquoise and white one – like the pink, a single color – that might just bring you back over to the aqua side, lol. I love this! Do you think it would work on a silk scarf? Thanks Madge! Yes, it can work on silk but with some caveats. The soda ash will, apparently, change the texture of the silk and make it less shiny and softer. 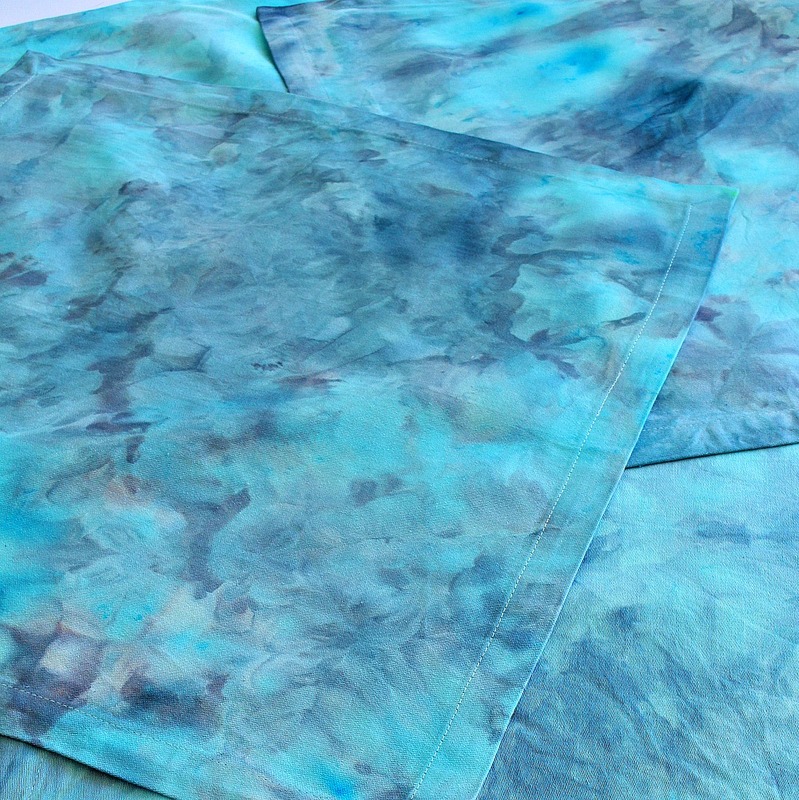 If you don't mind that change, then you can follow these same instructions for ice dyeing silk. 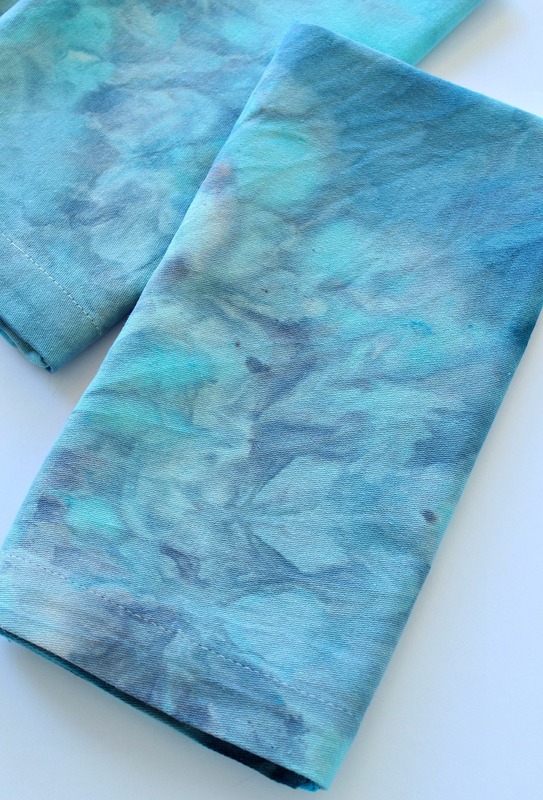 You could also try tie dyeing silk in the microwave for a similar look:http://www.dharmatrading.com/techniques/tie-dyeing-silk.htmlBecause I don't know much about silk dyeing, I found two articles that will help you:http://www.dharmatrading.com/info/fiber-reactive-dye-dyeing-wool-silk.htmlhttp://www.pburch.net/dyeing/FAQ/silk.shtmlIf the silk scarf is sentimental or valuable, I recommend experimenting on a fabric scrap first – ask your local fabric store for a little strip. I'd love to see how it turns out! Just curious – did you see a big difference between Rit dyes and the Procion dyes? I've only ever used Rit dyes as intended, this project called for a cold water dye. Rit needs hot water. 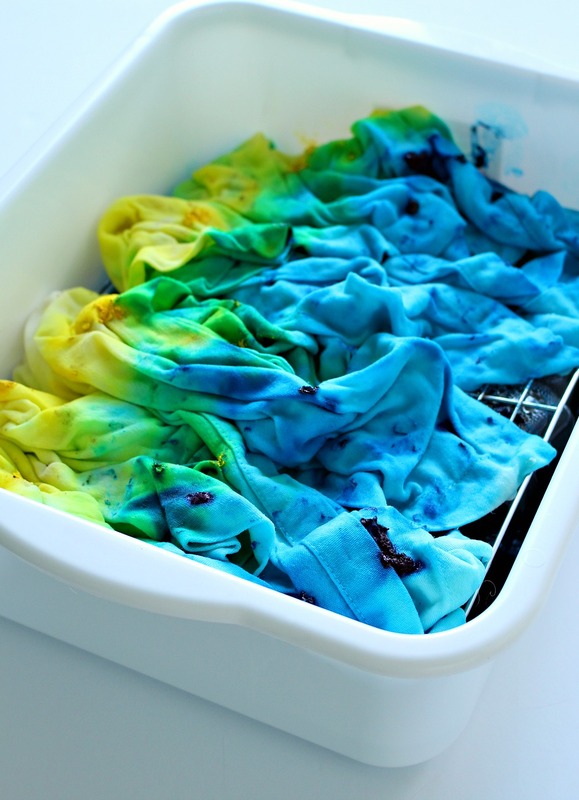 I like Rit for tossing in the machine to dye jeans darker, but I love this Procion for anything special, like overdyeing and this ice dyeing. Plus the colors are way better – better selection and more vivid.